The making of my paper dolls is based on a traditional method done in Japan years ago. Some of my dolls are completely made of paper, both the body and the clothing. 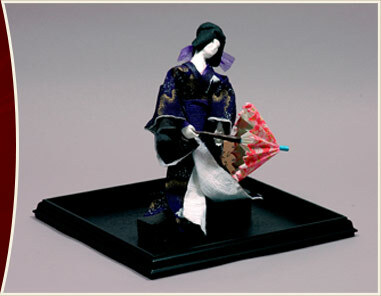 More recently, I have sculpted the body out of soft clay from Japan with paper continuing to be the clothing. Different kinds of paper are utilized such as rice paper, chiyogami (traditionally patterned paper), and washi (hand-made, very strong paper) that has been crinkled to make it almost cloth-like. I also create origami earrings, origami cards and origami collages. I love working with the medium of paper.